Note: You can make this DIY Cannabis Massage Oil in THC and/or CBD versions! Did you know that ancient remedies that were used at the time of Jesus’s birth are still as effective today? This topical oil is a good example. It’s easy to make from just three ingredients that were used in Biblical times: olive oil, frankincense, and cannabis. The scented oil is terrific to use as a massage oil, or even just to moisturize dry skin. Try rubbing it into dry cuticles and rough elbows and knees for instance. Of course, rub it on aches, pains, or sore joints. Bottles of this oil make thoughtful homemade gifts. And since topically applied cannabis will not make you high or cause you to fail a drug test, even people who don’t normally use marijuana can benefit from it. 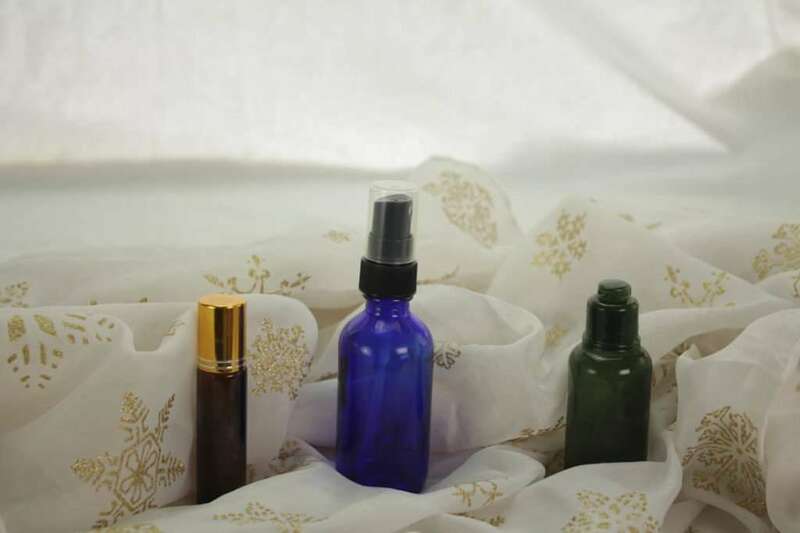 Let’s explore the three ingredients needed to make this Biblical Healing Oil. For many ancient cultures, cannabis was revered as a sacred plant. The original Hebrew version of Exodus speaks of holy anointing oil, made from copious amounts of kaneh-bosem, the Hebrew word for cannabis, and other herbs infused into olive oil. Applied topically, cannabis can bring relief to a host of issues including aches and pains, inflammation, itching, rashes, skin conditions like acne, eczema, and psoriasis, skin cancers, and much more. THC and CBD, along with their un-decarboxylated counterparts THC-A and CBD-A (as well as cannabis’s lesser known cannabinoids) all have medical benefits when applied topically, so opt for full spectrum, whole plant when possible. 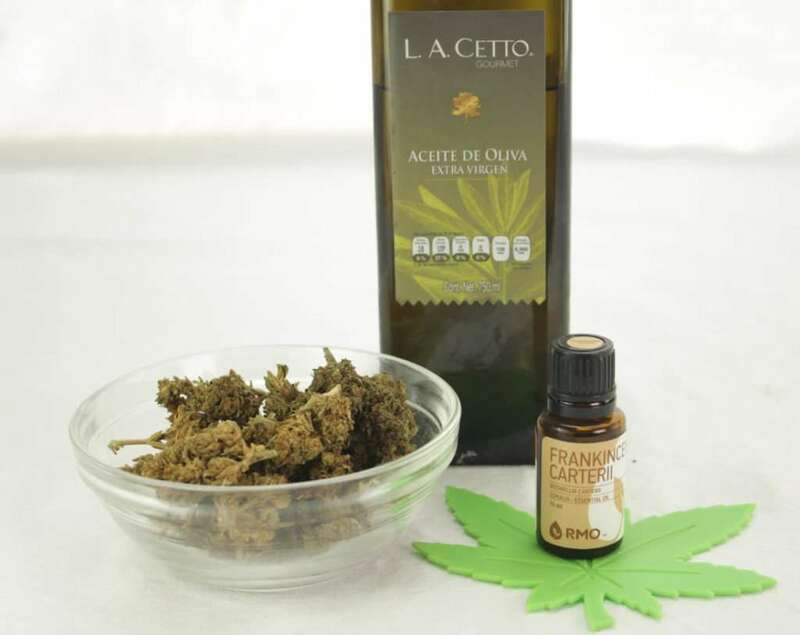 If you know how to infuse oil for cooking with cannabis (click here for directions if you don’t), you have the skills (and the product) you need to make this massage oil. If you don’t want to make cannabis-infused oil, you could purchase a concentrated THC and/or CBD oil-based tincture to make this healing and moisturizing massage oil. If you live in a legal state, your local dispensary should be able to recommend a full spectrum tincture with both THC and CBD. If you don’t live in a legal state, Joy Organics makes a quality THC-free full spectrum alternative that can ship to most places. When infusing oil for making marijuana topicals, you can use the same material you would use for edibles — bud and/or trimmings. You can also save some bucks by using your leftover already vaped weed AKA duff. Sure a lot of the cannabinoids are gone, but there are still lots left. If making an oil infusion from toasty vape leftovers, use about twice the amount of cannabis you would normally use when making canna-oil, otherwise the process is the same. Some people like to cook with this oil too. I find it gives me a headache, so I don’t usually bother, but it is great for using when making topicals like this massage oil. Frankincense, one of the gifts brought by the wise men to celebrate the birth of Jesus, is made from the resin of the Boswellia carterii, Boswellia ferreana or Boswellia serrata trees grow in parts of Africa and the Middle East. Besides being commonly used in perfumes and incense, Frankincense has many medicinal uses in common with cannabis including reducing pain, inflammation, anxiety, and stress. Frankincense can also reportedly help boost immunity and some early studies show promise in fighting cancer. Frankincense has antiseptic properties and some studies suggest Frankincense essential oil can kill bacteria and some viruses. When it comes to choosing an essential oil, not all brands are created equally. Personally, I am a big fan of Rocky Mountain Essential Oils and I use them for all my topicals making projects. While creating my Easy DIY Cannabis Topicals online course, I did a lot of research in the various essential oil companies. I chose Rocky Mountain Oils because they provide excellent quality at a fair price, have great customer service, and they are not an MLM company and will likewise not be pestering you (or me) to become a “distributor.” Whichever brand of essential oil you choose, be sure to use a pure natural Frankincense essential oil. 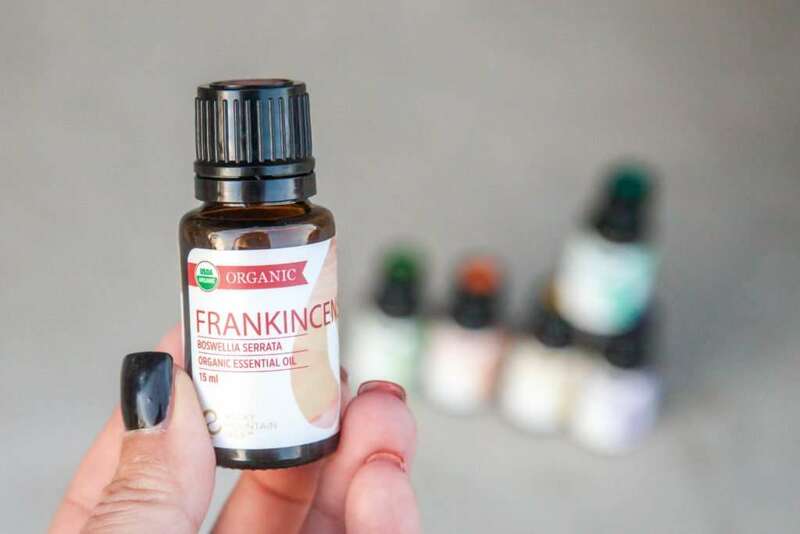 Learn more about Frankincense and its uses at Rocky Mountain Oil’s “All You Need To Know About Frankincense Essential Oils” page. Olive oil, yes the same kind you use for cooking and making salad dressings, can also moisturize and nourish the skin with vitamins, antioxidants, and has even been shown to have antibacterial properties. In fact a lot of times while cooking, I will use the opportunity to apply a little olive oil to hands and neck. For topical use you don’t need an ultra-expensive high-end gourmet brand, as the oil’s flavor profile is not so essential. Any decent cooking quality extra-virgin olive oil will do. Like edibles, dosing for topicals is highly individualized. Unlike edibles, you are not going to get too high if you overdo it, so no worries there. We currently have little data and science to go on as to optimal topical dosages. I like to aim for at least 20 mg THC and/or CBD per application, but this is something you can experiment with to see what works well for you. Over time, oils go rancid. Because this massage oil has no preservatives, try to use it within three months. 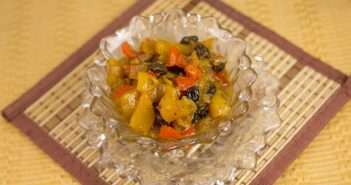 That should not be difficult, but if you think it might be, consider making half the recipe below instead. You can extend the oil’s shelf life by storing in the fridge between uses. Whenever possible, store cannabis-infused topicals in dark containers as they are light sensitive. Look around the house you might have something that might work. For instance, the bottle on the right above is an empty bottle travel-sized shampoo bottle. The others are bottles I ordered online. This oil will spray, so a spray bottle like the one third from left above is a good choice for applying to large areas such as the back. Also convenient are roller bottles like the one second from left. They work much like a roll-on deodorant, so you can apply the oil anywhere you have pain, from temples, to abdomen (for cramps), to sore knees. Check out Amazon.com’s entire selection of small dark glass bottles here. Of course, for massage oil, sometimes you just want a plastic bottle for convenience and safety’s sake. After all, even if it slips out of your hands, a plastic bottle won’t break. Find small plastic bottles here. Gather your materials. You will need: 1/4 cup Cannabis Infused Olive Oil, Frankincense Essential Oil and a small bottle or bottles to mix and store the oil in. Place cannabis oil (see notes above for options) in the bottle and add 40-45 drops Frankincense Essential Oil. Cap the bottle, shake to combine, and you are done! Wasn’t that easy? Use care with essential oils. They should never be applied undiluted and Frankincense essential oil should not be taken internally. Pregnant or nursing women should consult their physician before using essential oils. The same goes before using on children. Those with allergies and skin sensitivities should test new topical products on a small patch of skin before using regular portions. Do Cannabis Topicals Get You High or Cause You to Fail a Drug Test? Does Topical Cannabis Really Work?